Nvidia has been the apotheosis for technological innovation and even with the bear market of late 2018, the stock has seen a meteoric rise in stock price and relevancy. It truly has become one of the crown jewels of technology's future. But, even in that time, there is a trigger in Nvidia Corporation (NASDAQ:NVDA) that has preceded stock drops, turning a massive bull into a profitable bearish momentum back-test that has not triggered a losing trade in more than 5-years and showed triple digit returns during the Great Recession from 2007-2009. At the end of each day, the back-tester checks to see if the long put is up 20%. If it is, it closes the position. If after 10-days the limit has not been hit, the put is closed so not to suffer total time decay. ➡ The average percent return per trade was 92.3%. You can check to see the moment a stock dips below the 200-day MA for NVDA on the Pivot Points tab on www.CMLviz.com. Notice how the trigger is 'silent' for a long period of time, and then triggers as the stock price sees a technical breakdown. That's exactly the goal. And finally we can look at the period from 2007-2009, which includes the Great Recession. 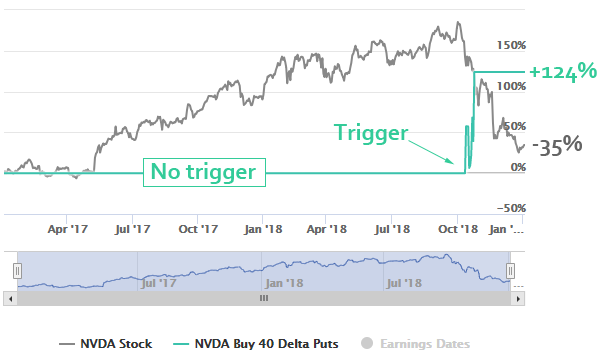 In a period where NVDA stock was down 22.4%, this bearish trigger saw a 135% positive return.